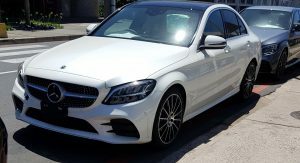 While most tweaks brought forth by the facelifted Mercedes-Benz C-Class will be subtle, we can at least look forward to a more aggressive design for the C43 variant. 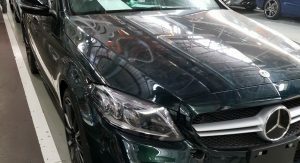 These images were captured by a Zero2Turbo reader at the Mercedes-Benz Greenfields manufacturing plant in South Africa. 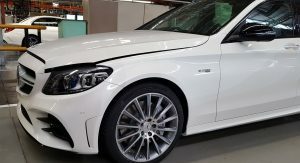 They show multiple C-Class saloon models, among them two facelifted versions – this C43 and a white C180 (spotted outdoors). 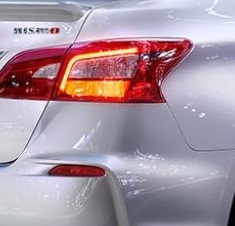 As for that white C63 S sedan, it’s the current model, judging by its taillights. Yet, it’s the C43 AMG that steals the show with its more aggressive rear styling. The pre-facelifted version had a smaller diffuser with a set of quad exhaust tips neatly embedded within the plastic. As you can see, the new car will boast round tips that peak past the diffuser, itself looking sportier than it did before, with four aero fins instead of three. Mercedes will showcase their re-styled C-Class range at the 2018 Geneva Motor Show. 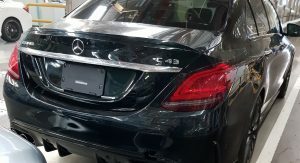 However, whether the C43 will be there remains to be seen. 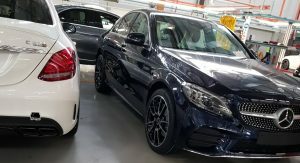 The rest of the range (sedan and estate models) will show off the new bumpers, revised lighting units and updated interior. The latter will come with an optional 12.3″ digital instrument cluster, and a resolution of 1920×720 pixels. A new steering wheel will also be thrown into the mix, boasting touch-sensitive controls, while other features will include the updated touchpad controller with haptic feedback, turbine-look start/stop button, upgraded head-up display and improved voice control system. 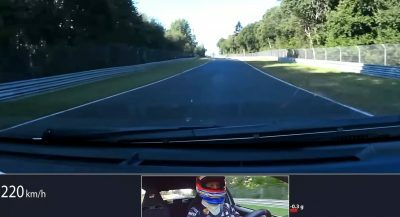 As expected, Mercedes have also added the latest in driver assistance technology to the 2019 C-Class, helping it drive on its own in certain situations. looks nice. i want more interior pics. well, that’s been mercedes’s design first, so actually the G70 copied Mercedes. For goodness sakes, make MB’s boxier again. They all look pleasant enough, in that featureless, inoffensive, wind-tunnel-dictated jelly bean shape. 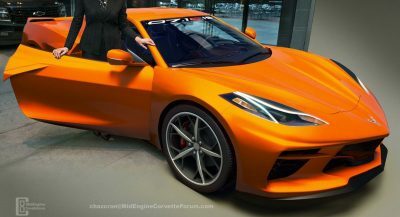 But, that they are not beautiful from a company that once made some of the most beautiful cars out there, is truly a shame. They still make the most beautiful cars now. Outside of just a very few of their entire lineup, no, they certainly do not. Arguably, the AMG GT is beautiful from some angles and the C63 coupe is reasonably good looking thanks to the wider body in the rear. Outside of those, they aren’t “beautiful”, they are definitively generic. Totally agree. MB sedans don’t look very stately. Though the GT really does something to me. Something good. taillights off a nissan sentra. I know a lot love this generation of mercedes, but these designs are so uninspired, dont age well, and look so meh. The entire Mercedes lineup is so boring. 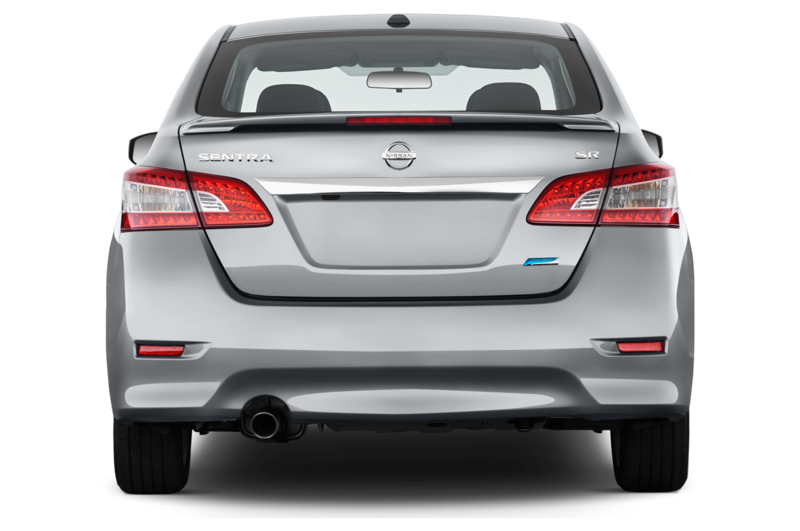 LOL nice try, thats the last gen, the current gen nissan sentra has very similar taillights and you not standing people like me is stupid. 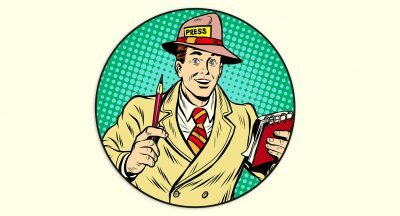 I am an independent person who is entitled to his own opinions. I dont like it and dont force others to follow what I like. To each his own. actually this is still the same gen just a facelift, and your picture proves my point more. sorry i hurt the little 8th grader’s feelings. ill cry about it all day for you. okay? lmao gtfo. It does look like a sentra. No it doesn’t. The tail lights look nothing alike. I’m going to assume you and the other guy are trolling or you both need corrective eye surgery. Yes the taillights in similar in that…they’re both red. How the car looks on the pictures, Mercedes-Benz still did a good refresh that is very minor but noticeable to me.